reciepes « Peeter Joot's (OLD) Blog. This was a favorite of my dad, Jaan Joot. I’m pretty sure that it is actually Vanaema’s recipe. I used way too many rice noodles for that little Lasagna (a one pound package would have done). For the regular lasagna, I used about 3/4 of a package of spinach noodles, which was also too much, but I’ll be able to use the leftovers for something else. 1 package (500g / 1lb) lean ground beef. 1 container of cottage cheese (don’t have to bother straining). Bag of shredded mozzarella on hand. Parmesan to grate on top when done. A bunch of mushrooms (~12), sliced. A bag of spinach, fried to make it easier to handle when layering. 4 cloves of garlic, rasped. I tried doing the prep work more concurrently, and had at any given time, two frying pans going with one of the fry-em-up ingredients (ground beef, spinach, mushrooms, peppers, zukes). A bit of liquid seems to help expedite the cooking times for some of the vegies. The two batches of noodles were also prepared in these times. In the end, combine the meat, peppers, zukes, mushrooms, and the sauce in a big pan, and mix em and cook em a bit all together. This is also when I used the kitchen rasp on the garlic. 375 F is the temp I have in my notes from last time, but I don`t recall for how long. A half hour with a few minutes on broil at the end will likely do the trick. I`ll be interested to see how these ones turn out (especially the gluten free variation). Below is the recipe that I tried cooking for the kids today. The kids completely boycotted it, because of the vegetables. I’d agree that it’s worth boycotting because it didn’t have much flavour. Michelle says it needed cumin and paprika. 1) Use of the pot roast is very time consuming. Had to cut all the grizzle off, and it took time to dice it up, and brown it. The meat itself, once slow-cooked, turned out quite nice, but for chili, ground beef probably would have been much easier and faster. 2) Something is needed to go with it. Rice or polenta would have worked. I used left over mashed potatoes from yesterday. 3) Flavour rescue. Liberal dosing with shredded cheddar helped, plus more salt, and some pepper. Finally scooping it up with some corn chips (also themselves salty) made it tolerable. 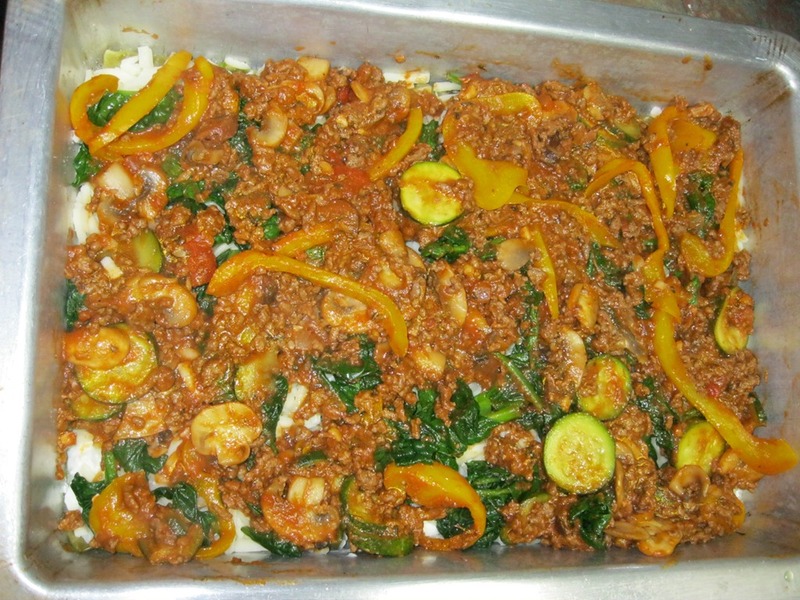 4) I messed up following the instructions and fried the green peppers along with the onions and other veggies. Five minutes didn’t do the job to make that whole mass of veggies soft, so I cooked it longer, but I think that I probably could have done just the onions and then dropped all the rest of the veggies into the slow cooker pot as is. 5) I omitted the hot pepper sauce since I figured the kids wouldn’t go for it. Perhaps that would have made up for some of the missing flavour. Since slow-cookers were invented as appliances for making baked beans, chili is a natural fit. Slow-cooking really tenderizes shoulder cuts, creating a rich, beefy broth. We recommend cutting a pot roast into chunks for this chili because the meat will be juicier. Stewing beef is a reasonable shortcut but, because it is lean, can be dry after slow-cooking. Enjoy with corn bread and a mixed green salad. In large skillet, heat half of the oil over medium-high heat; brown beef, in batches and adding remaining oil as needed. With slotted spoon, transfer to bowl. Pour off any fat in skillet. Reduce heat to medium; fry diced onions, carrots, celery, minced garlic and oregano until vegetables are softened, about 5 minutes. Scrape into slow-cooker. Add tomatoes, tomato paste, black beans, kidney beans, chili powder and salt ; stir in beef and any accumulated juices. Cover and cook on low until meat is tender, about 6 hours. Skim off any fat. Stir in diced green pepper, and hot pepper sauce (if using). Cover and cook for 30 minutes. cookin for the kids. recycled noodles. – warm some spaghetti sauce in a small pot. 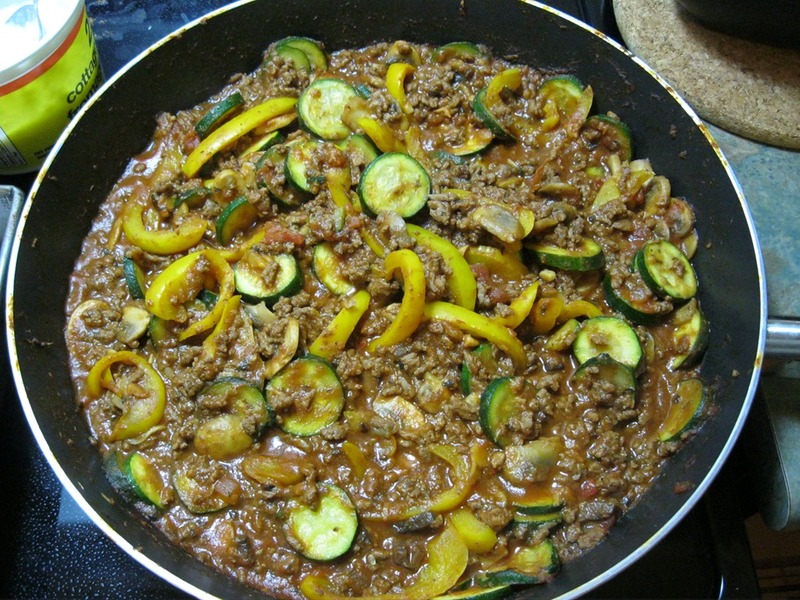 – cut some zucchini into strips and fry it up, also in a bit of butter. Of course the kids boycotted the zucchini, but I liked the combo of noodles, zuchs and sauce. The whole thing was simple and fast. 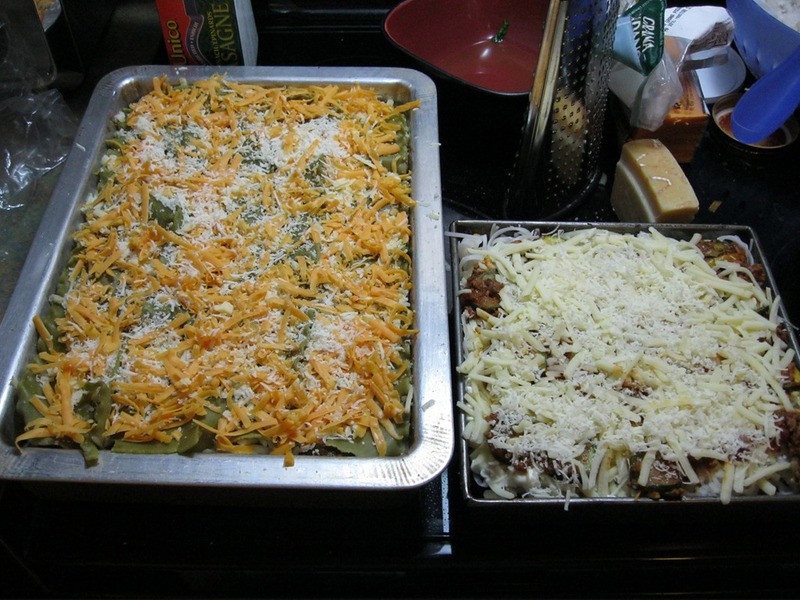 About 16 lasagna noodles for one big pan (spinach noodles are nice). Whole box if making 1.5 pans (ie. one for freezing). A bunch of mushrooms (~12). Dice up the shrooms, and fry em. Add a bit of white wine to help them get soggy, and fry till the wine evaporates. Dice up the pepper. Small enough that the kids and wife won’t try to pick em out. Cut zuke into smallish pieces, and fry em up too (separate from the mushrooms since they cook at separate speeds). Fry up the ground beef. If frozen make sure to take it out of the freezer in the morning (if cooking mid afternoon). Breaking it up right at the beginning is helpful so it doesn’t clump. Now’s a good time to get the noodles cooking. Combine the meat, the peppers, the mushrooms, and the sauce in a big pan, and mix em and cook em a bit all together. Michelle says I should have fried the spinach a bit to make it floppy. Try that next time. That would also make it easier to add it to the layers, because it makes the layers all wobbly when putting it on raw. 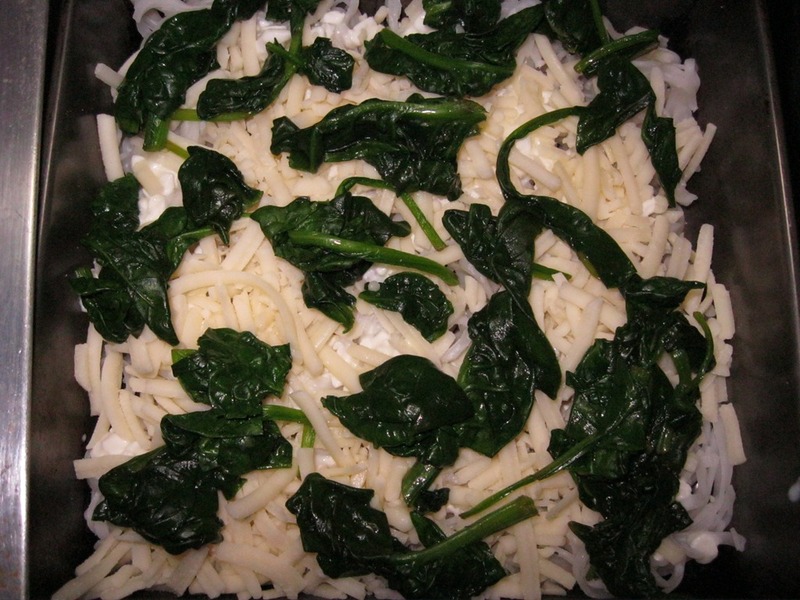 –	cottage cheese, then mozzarella, then sauce, then some spinach. 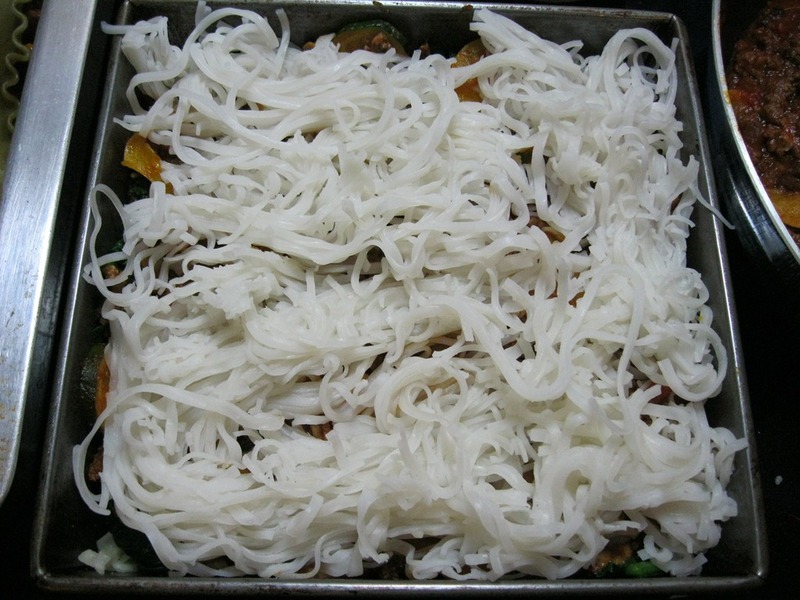 –	noodles, mozzarella, then grate on the parmesan. Cover with foil and cook at 375 (having preheated oven), then 5-10 more minutes uncovered. I’m not sure if the foil makes a difference and I’m going to try next time without it.